Christopher Saxton was a surveyor and publisher and though his dates remain uncertain he flourished between 1570 and 1596. He was the first person to produce a printed set of county maps and is known as “the father of English map-making”. 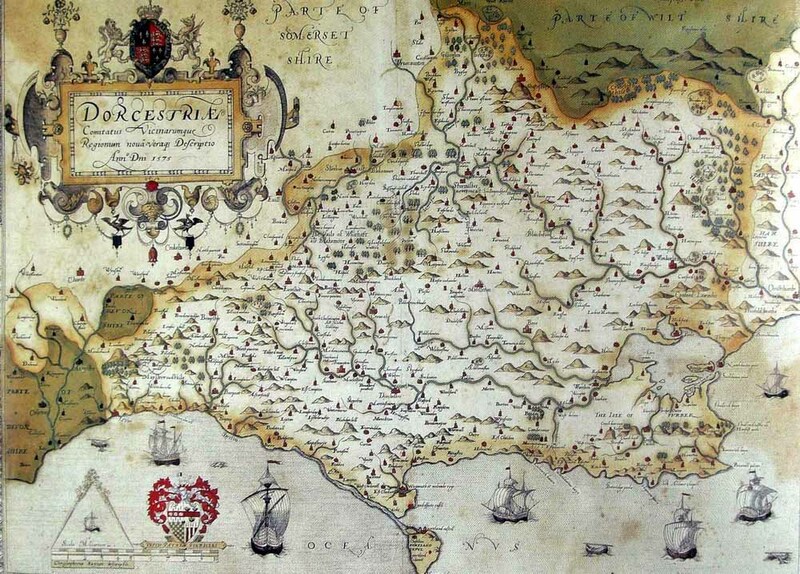 His map of Dorset, measuring 54 x 37.5 cms (21 x 15 ins) and printed in 1575 (four years before his Atlas of the Counties of England and Wales was published), is distinctive for a number of reasons. It has an extremely decorative cartouche, surrounded by ornamental strapwork and surmounted by the Royal Arms of Ellzabeth, ﬂanked by the Lion and the Dragon rampant. The Dragon was replaced by the Scottish Unicorn when James I became King. The other coat-of-arms is that of Thomas Seckford, Saxton’s patron. Seckford was a Master of the Requests to Elizabeth I and without his support Saxton would never have been able to achieve all that he did. Saxton’s maps were finely engraved on copper plates by a team of English and Flemish engravers. There are two distinct lettering styles for place names. Larger towns and cities are in capital letters; script is used for the rest. The sea is dotted or ‘stippled’. In the Dorset map a sea creature slips through the waves amongst sailing vessels and fishing boats. The fishing industry is also reﬂected in the hooked fish hanging from the underside of the cartouche. A large pair of dividers surmounts the scale. The hilly regions are depicted by a series of ‘molehills’ and the parks are bounded by railed fencing. No hundreds (administrative and legal districts dating from Saxon times) or roads are detailed (although both appear on the later issues of the atlas by Philip Lea). Amongst much that is of interest on the map is its inclusion of the last of the ninety or so medieval deer parks, of which 17 still survived. All 6 containing deer in 1583 (Gillingham, Holt, Hooke, Melbury, Melcombe and Sherborne) are shown. The other parks included by Saxton are Marshwood, Crekelade, Blagdon, Athelhampton (spelt Addlemaston), Canford Farm and Canford Magna. Some forests are also shown: Gillingham Forest in the north of the county, Cranborne Chase in the north-east and Holt Forest in the east. Idiosyncratic features are the piece of Devon tucked into the arm of the River Axe and the parish of Holwell being “part of Somersetshire (anomalies that persisted until the 19th century) and the marking of a church at Newton on the Isle of Purbeck where none was ever built. No zoomable map at the moment.